Over the course of the summer we see quite a few yachts and at the end of January sailing boat s/v Sila sailed in to Grytviken. On board were parents Molly and Chis Barnes, their two sons, Porter and Jack, and family friend Adam. 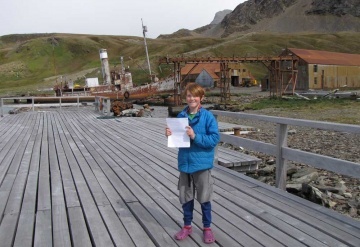 They spent several days exploring Grytviken and went on a tour of the whaling station with curator Deirdre Mitchell. They then sailed away to further explore the island. A couple of weeks later they were back alongside and Jack read us his poem about the whaling station. We thought it was so good we wanted to share it with you. He has very kindly agreed to let us post it here, and you can also read it on sila’s own blog - http://svsila.blogspot.co.uk/. We hope you enjoy it as much as we did! To use blubber and dump all the rest." Was over, but what about? This page was last modified 17:26, 20 February 2015. This page has been accessed 7,184 times.